Calling all runners, joggers, and walkers. Are you interested in completing a 5k? 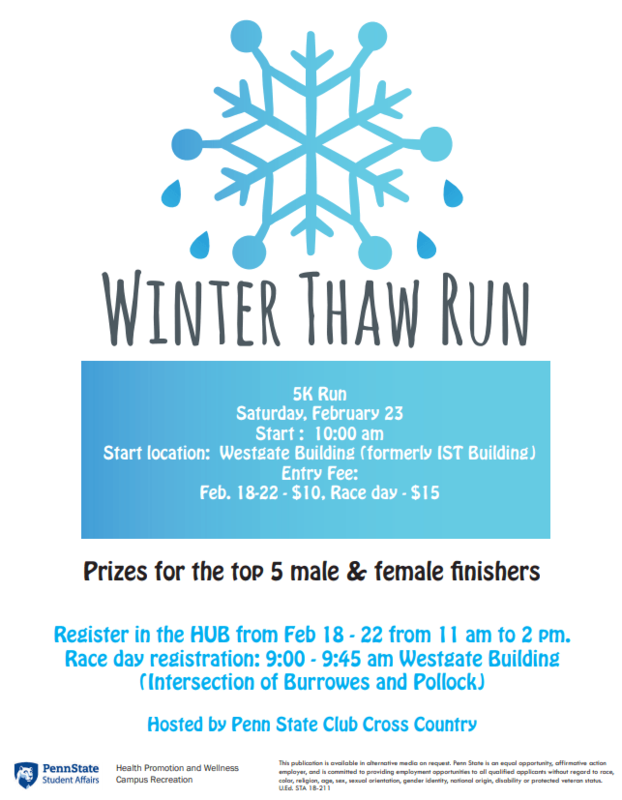 Join Club Cross Country, Campus Recreation, and Health Promotion and Wellness on February 23rd for a fun Penn State community event, the Winter Thaw 5K. The event starts at 10:00 am at the Westgate Building (intersection of Burrowes and Pollock). The pre-registration table will be in the HUB 11 am to 2 pm on February 18 – 22. The registration fee is only $10 prior to race day. Registration fees increase to $15 on race day, February 23. Look for the Winter Thaw Run banner. Participants are guaranteed a race bag filled with goodies. Race day registration is $15 and will start at 9:00 am on February 23rd at the intersection of Burrowes and Pollock. The top five male and top five female finishers will receive prizes. Registration forms will be available at the registration tables. A downloadable version is available here.